A great and simple way to make sure your garage door stays in a great working condition is to regularly examine all of its different components. This will help you catch minor issues before they grow into big problems. If you want to make the most out of your maintenance routine, start by inspecting the different parts for evidence of wear and tear damage. There is no point in cleaning or lubricating components which are in a terrible shape only to have to get them replaced a day later. Start with the springs. Watch out for scrapes and deformed coils. If you have extension springs and they have permanently stretched coils, they should be replaced right away. The cables should be checked for fraying and minor cuts. If any of these issues are present, a timely replacement will be the best solution. 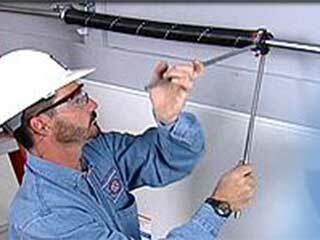 Inspect the vertical and horizontal tracks for blockage and bending. Take a closer look at the bottom sections to see if they have any rust on them. Check the hinges for bending and the rollers for twisted stems and worn wheels. All of these components play a vital role in the smooth and safe movement of your door, so any sign of damage must be dealt with as soon as possible. Ideally, the rail should be perfectly straight. If it is even slightly bowed, it has to be fixed right away. This problem is usually due to an inaccurately set force limit. It has to be adjusted in order to prevent further damage to the rail and overstraining your opener. The trolley is the small component driven by the chain, belt or rod (depending on the type of opener you have) along the rail. If it is has become worn or damaged, it should be changed. Otherwise, it will soon break and make the opener useless. You wouldn’t want to be forced to open the door manually. While the motor unit is protected by a tough casing, the controls are much more likely to get damaged. Check the remotes and the keypad for cracks, dents, chips, and rust. If you find anything out of the ordinary, or anything that needs to be replaced or repaired right away, contact our team at Garage Door Repair Las Vegas. We'll take care of everything for you.